On a run through Keizer the other day, Mr. B. noticed the sign for the Old Mexico Grill. It was a restaurant he hadn't seen before, and he stored it away in his mind for a future visit. Mr. B. and I both attended college in San Diego, so Mexican food is near and dear to our hearts. 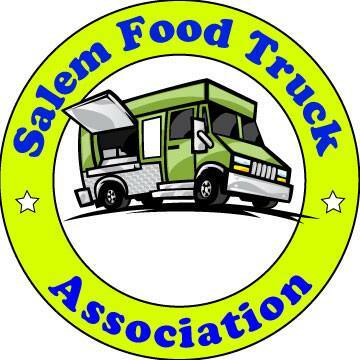 We are in the midst of an ongoing quest for the best Mexican food that Salem has to offer, and always excited when we discover a new restaurant. Even before Mr. B. knew about his issues with gluten he was a huge fan of all things corn. Popcorn, corn-on-the-cob, corn tortilla chips, and especially tamales will make his heart sing. Tacos are a common meal in our home, and there is always a bag of tortilla chips in the cupboard. When we learned about Mr. B. 's gluten intolerance we began exploring the ingredients of his favorite foods. Surely corn tortillas would get the thumbs-up, right? Sadly, not always. It seems that more and more manufacturers are adding wheat flour to their corn tortillas, even though it is not a traditional ingredient. It has been said that there is a growing consumer demand for a chewier, softer textured corn tortilla, and adding glutenous wheat flour does the trick. Many restaurants are doing the same. Even if they make traditional style corn tortillas, most will dust their surfaces with wheat flour when rolling them out, thus cross-contaminating them. Therefore, Mr. B. and I have learned to always ask before sitting down to a Mexican meal. So when we approached the doors to the Old Mexico Grill and saw the words "gluten free options" printed on the window, we couldn't wait to get inside! The restaurant is small, but decorated brightly and cheerfully. The menu boasts not only a variety of gluten-free options, but also that they use no freezers, no microwaves, no canned goods, no trans fats and no MSG. They make their salsa and tortillas fresh every day. The menu is packed with typical Mexican fare, and the majority of items are marked "g free." Also noted on the menu are the weekend specials- pork and chicken tamales ("hurray for Saturday!" exclaimed Mr. B), menudo and pozole. 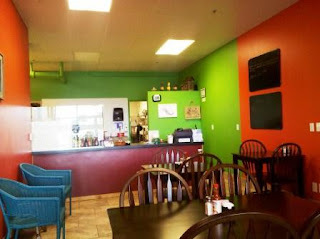 Other notable menu items include organic coffee with organic half & half, and fresh squeezed limeade. 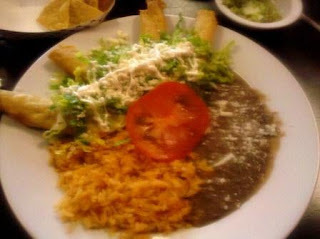 We were quickly served a basket of excellently crunchy tortilla chips alongside a small dishes of refried beans and salsa. I hoped and expected the salsa to be spicier than it actually was, but it was still very fresh and tasty. 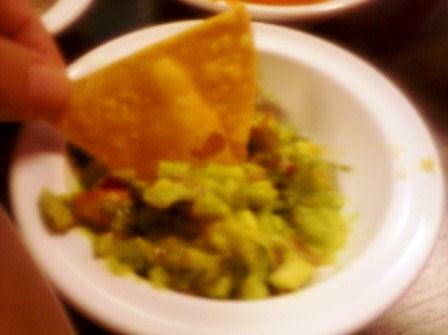 I knew that we needed an order of guacamole to accompany this trio of yumminess. It arrived in the same small sized dish in which the beans and salsa were served. I am a guacamole junkie, so I while I was hoping for a larger portion, I was delighted by the guacamole's bright, pure taste. I would have licked the bowl if Mr. B. didn't beat me to it. I briefly considered ordering a second guacamole, but thankfully my giant lunch portion arrived before I could. I ordered the gluten-free chicken corn flautas, garnished with romaine lettuce, sour cream, queso fresco and a slice of tomato. The flautas were pleasantly crunchy and the shredded chicken was good, though I would have preferred a bit more seasoning. This was easily remedied by dipping them in the salsa that we neglected after the guacamole arrived. The menu indicated that my order would not include rice or beans, but in actuality my flautas arrived with both. Had I known that, I might have requested the "freshly simmered Black Beans" rather than more refried beans, but they were delicious and a bonus, so I didn't object. 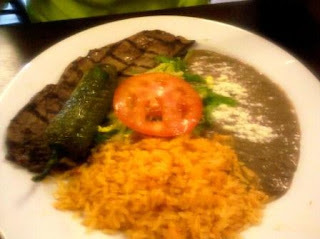 Mr. B. ordered the carne asada combination with corn tortillas. It arrived with a generous portion of refried beans and rice, a slice of tomato, and a grilled jalapeno pepper. He also ordered a chicken tamale that arrived sans corn husk shell with little cups of tomatillo salsa and sour cream. Being the tamale connoisseur of the household, I was curious to hear his opinion on this one. He said "it is perfect." I found it to be a bit bland for my taste, but good- especially with the addition of the smoky tomatillo salsa. I'd like to personally comment on the carne asada, but it was pretty nearly gone by the time my belly was full. Its quick disappearance is testament to its quality, I'm sure. Hats off to the Old Mexico Grill for a delectable meal, fresh ingredients, and dozens of gluten-free options to keep us coming back for more. -Me & Gluten-Free Mr. B. We went there on their first day of operation, so the comedy of errors which ensued was somewhat forgivable. I notice a common thread throughout your review with comments like: “a bit bland”, “could have been spicier” and “preferred a bit more seasoning”. We couldn’t agree more. I earnestly hope they’ve added a condiment bar. The only condiment on the table, or anywhere visible in the place, was a bottle of Tapatio Hot Sauce which I, mercifully, put to good use. When we got home and were discussing our experience, we thought we may have been undercharged. I didn’t save our receipt, so I had to wait for our Visa bill to arrive. Sure enough, we were undercharged $7.50. I had to make another trip to Keizer to make it right. Granted, it was their first day and allowances must be made for that. I haven’t tripped over myself getting back to try them again, but I will go back. If they don’t spice things up a bit, or at least provide the condiments for me to do so, my second visit will be my last. @ Me & Gluten-Free Mr. B. FYI. An on-line acquaintance from another site says Kwan's is very accommodating to folks with gluten intolerance. Thanks Chuck Bradley! Mr. B. and I have eaten at Kwan's on a few occasions, and have always had great food and great service. They are very accommodating indeed. As for Old Mexico Grill, Mr. B. and I dined there again a few days ago, and I'm happy to report that the salsa was definitely spicer and more flavorful than our first visit. We shared the potato and chorizo enchiladas and the enchiladas verdes, and both were absolutely delicious. I will give Old Mexico Grill another try on the strength of your recommendation.